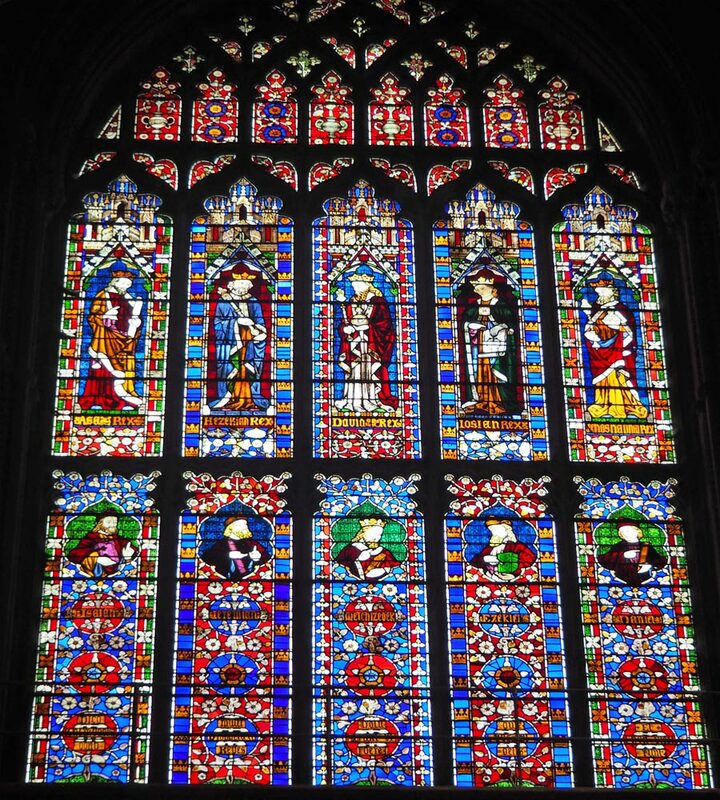 There’s a lot of stained-glass in Lincoln cathedral. Many different dates and styles from medieval (†13C) to the mid-nineteenth century. 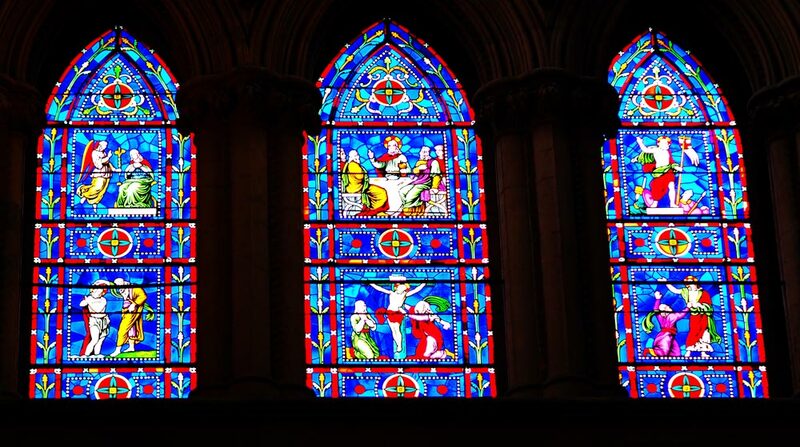 The nave is lit by intense colours from the mainly mid-nineteenth century windows such as these memorial windows. 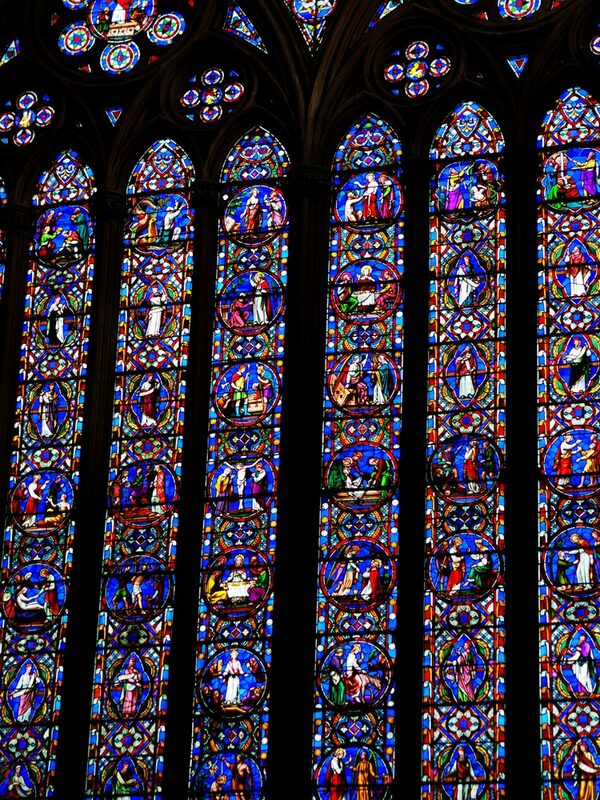 Several different studios made the windows on the south side of the nave, which explains the variations in style. The windows in the Chapter House were all by one studio, Clayton & Bell, to give a more cohesive look. Boole is a name that I am very familiar with and not in a good way! It was George Boole who devised the Boolean Logic system, based on the idea that a thing cannot simultaneously have a set of properties and not have them. The power in an electronic circuit is either on or off. Sounds pretty simple. Boole converted this concept into abstract symbols to help solve complex problems. In the Boolean system ‘true’ or ‘on’ is represented by 1 and ‘false’ or ‘off is 0. Known as Boolean Gates. His ideas laid the foundation of mathematical logic and provided the theoretical underpinning for all modern computer logic. So why do I dislike Boole? Because part of my computer degree was in mathematics, more precisely, Boolean Algebra. Not only did I find it impossible to understand, it almost caused me to fail my first year math’s exam! But I did seek out his memorial window. 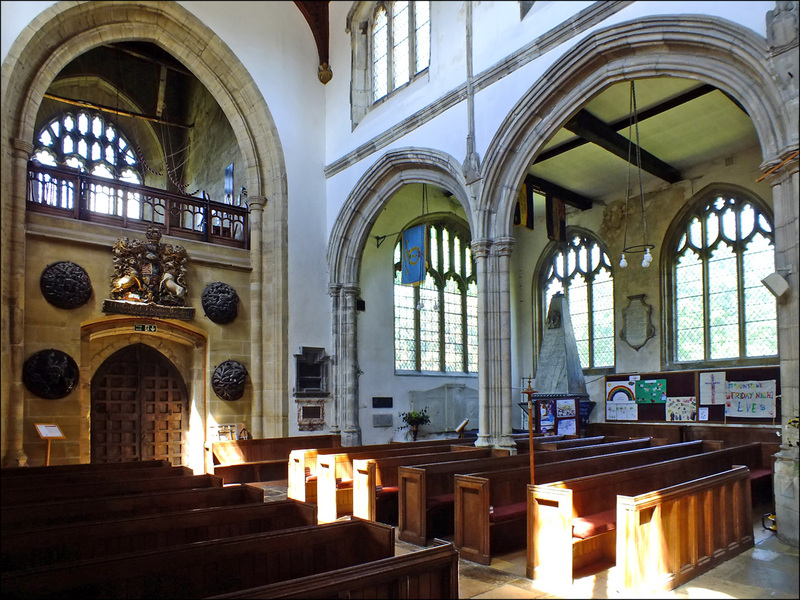 At the crossing you find the Dean’s Eye to the north which contains some original pieces depicting the Last Judgment. 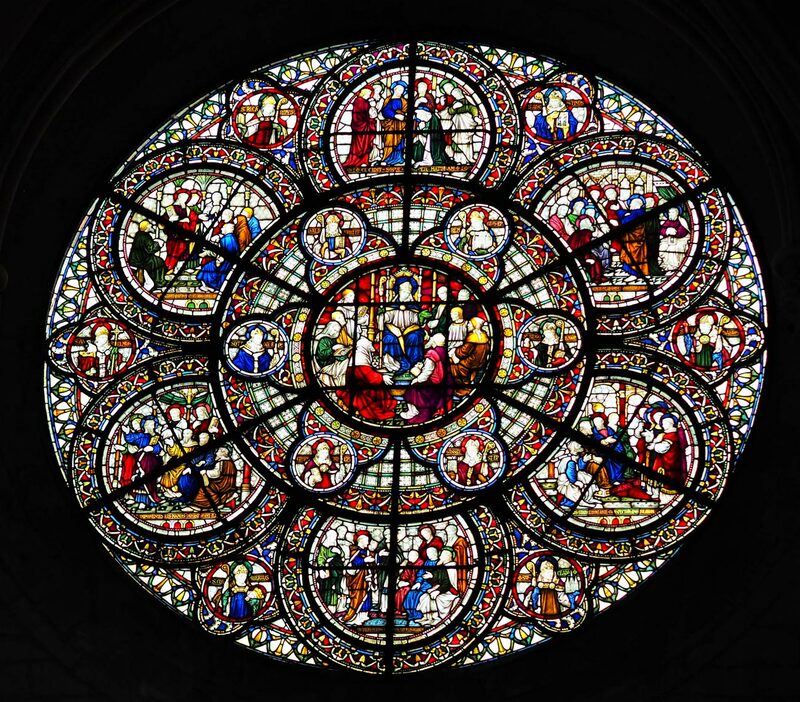 This window survives from the time of Hugh of Avalon’s re-building between 1192 and 1235. 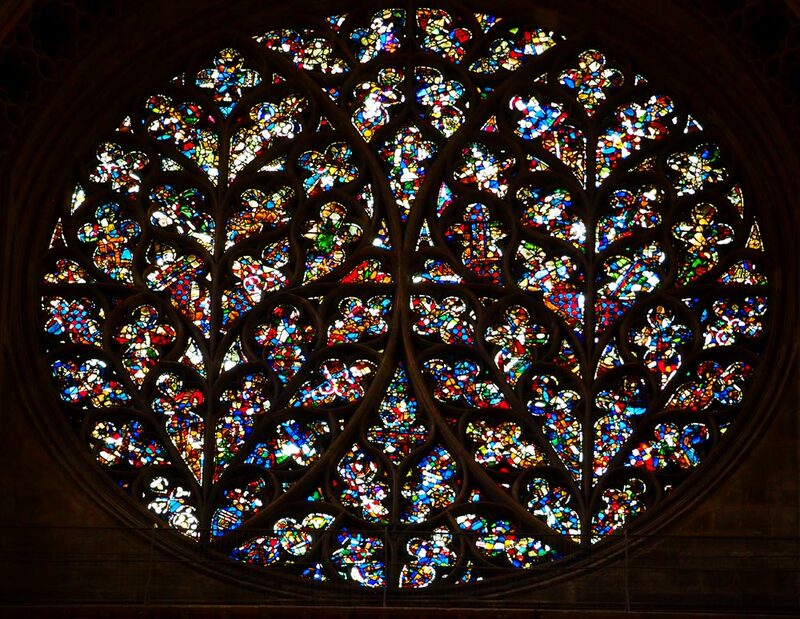 To the south is the Bishop’s Eye filled with a kaleidoscope of ancient glass. 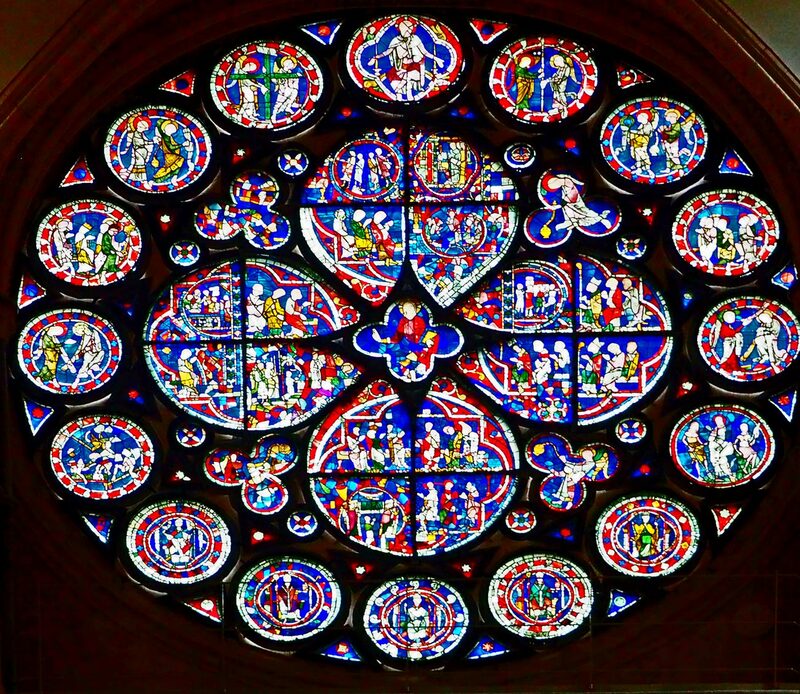 It was most likely rebuilt circa 1325–1350 after the completion of the Minster and shows the beginning of the decorated style with the flowing tracery representing leaves – a unique pattern. 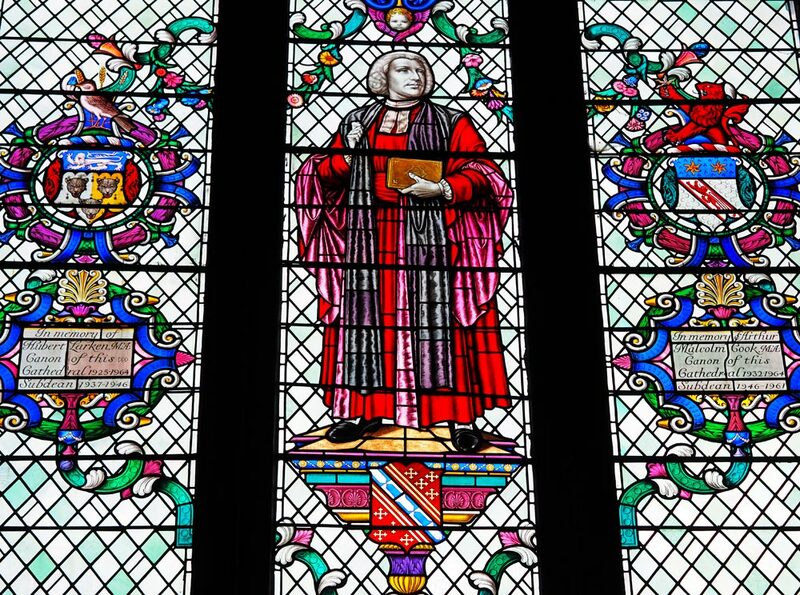 The Great East Window was only the second nineteenth century window to be installed in the cathedral and subject of a great debate. Such is its size that it is not possible to photograph it without tilting the camera upwards – hence the peculiar angle. The nearby Service Chapels allow a contrasting glimpse of modernism on stained glass in the twentieth century. And in the Chapter House an oculus showing ‘The Council at Jerusalem, surrounded by various other scenes from The Acts of the Apostles’. In memory of Jacob Clements, (1820-98) sometime SubDean at the Cathedral. (Clayton & Bell). So many scenes catch my eye, and the colours are incredible. 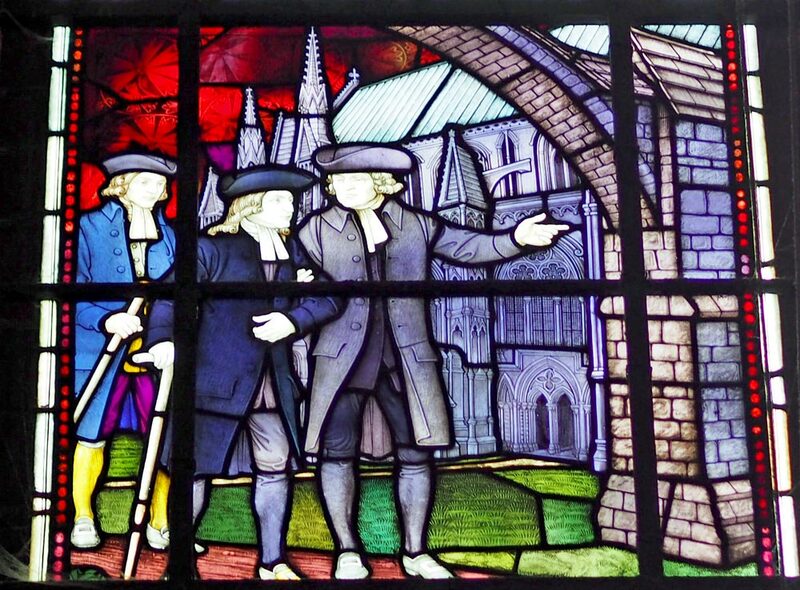 Below, Dean Kaye escorts John Wesley on his last visit to Lincoln Cathedral in 1799 (Clayton & Bell 1909) in the Chapter House. 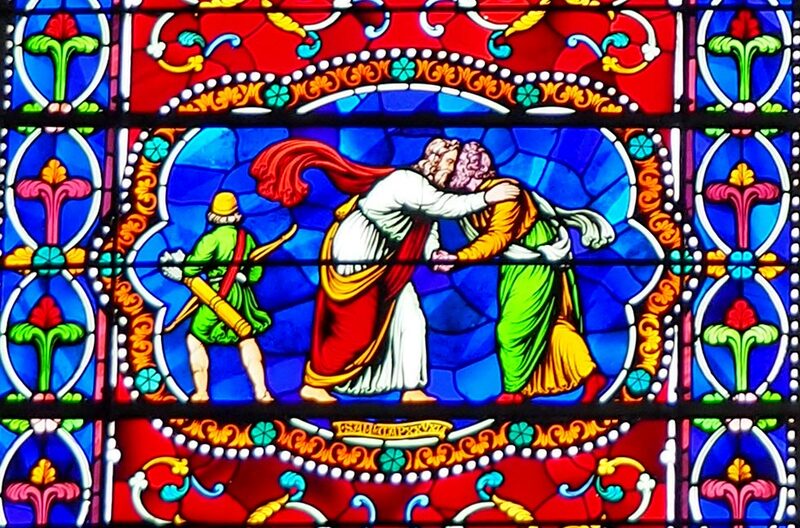 Familiar Old Testament and New Testament scenes are depicted. My eyes are drawn to the different styles, the stylised flowers, the geometric shapes and patterns. And finally I have a question for you, the viewer. I’m not entirely happy with showing the full length of the windows, because they are narrow and not very easy to see, which is why I select portions to enlarge. 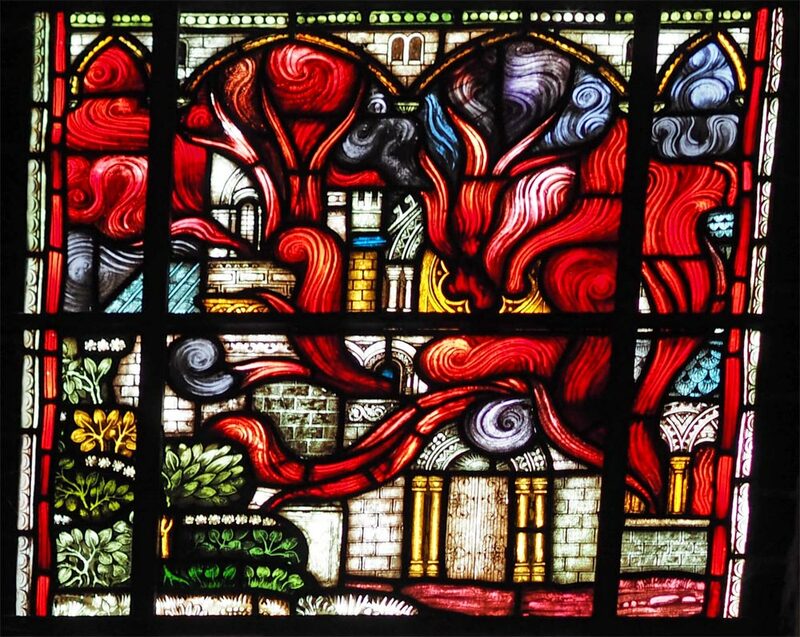 However I do realise that it is nice to see the whole window as then you get a sense of the patterns and tone. So I would be grateful for any feedback you can give me on this subject. In future should I just select samples of the windows so you get a better view, or not? Finally, the windows. I am only going to show you a few glimpses of some of the windows, to be honest it is was quite dark inside this cathedral on this day (it was raining) and not easy to photograph the stained-glass. 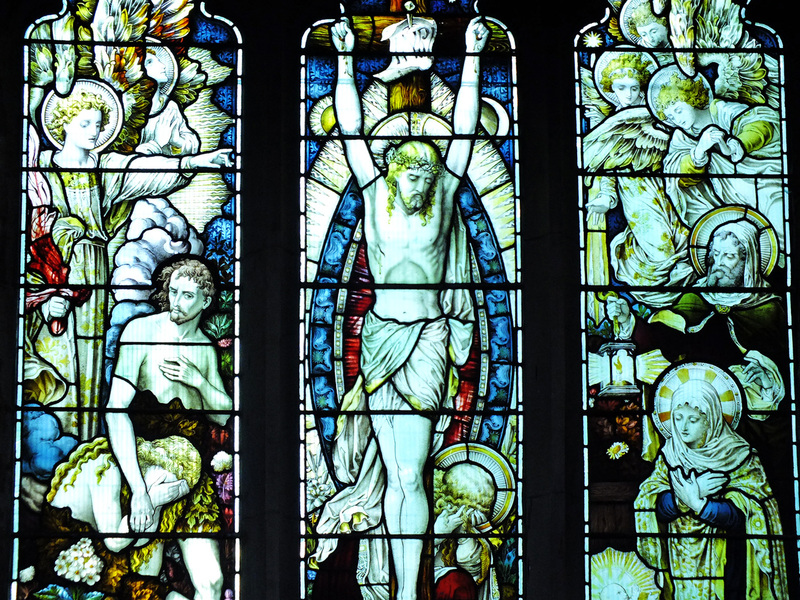 There are some lovely pieces so if you are able to visit then make sure you examine the windows or visit the Norfolk Stained Glass site which provided much of the information about the windows in Norwich Cathedral. The Bauchon Window was designed by Maria Forsyth and made by Dennis King of G King & Son in 1964. 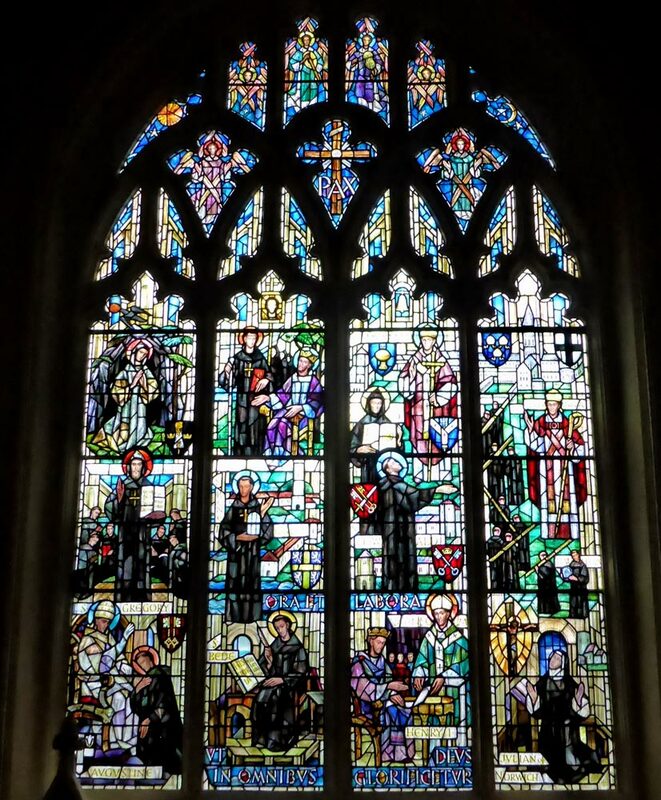 The window given in honour of Julian of Norwich is in memory of Harriet Mabel Campbell (1874 – 53). The main lights depict Julian of Norwich, unusually dressed as a Benedictine nun, together with another eleven Benedictine Saints and other personages. 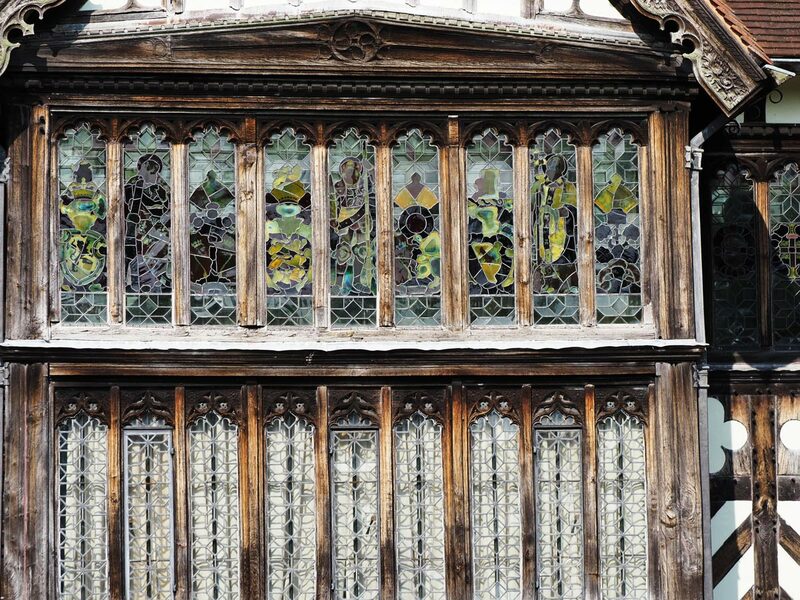 It has been a while since I found some interesting windows to post, but at last here are some from the marvellous Wightwick Manor in Staffordshire (near Wolverhampton) which is designed in the Arts and Crafts style. Trelissick’s colourful history stretches as far back as 1750 but it’s most distinguished owner was Leonard Cunliffe, a former director of the bank of England. Trelissick has no less than four summer-houses. 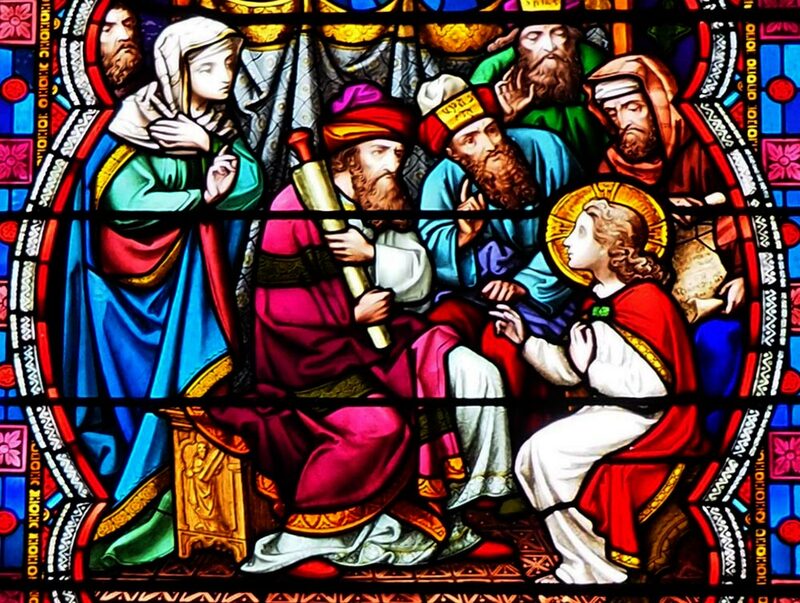 One in the area called Carcaddon* has two beautiful stained-glass windows. 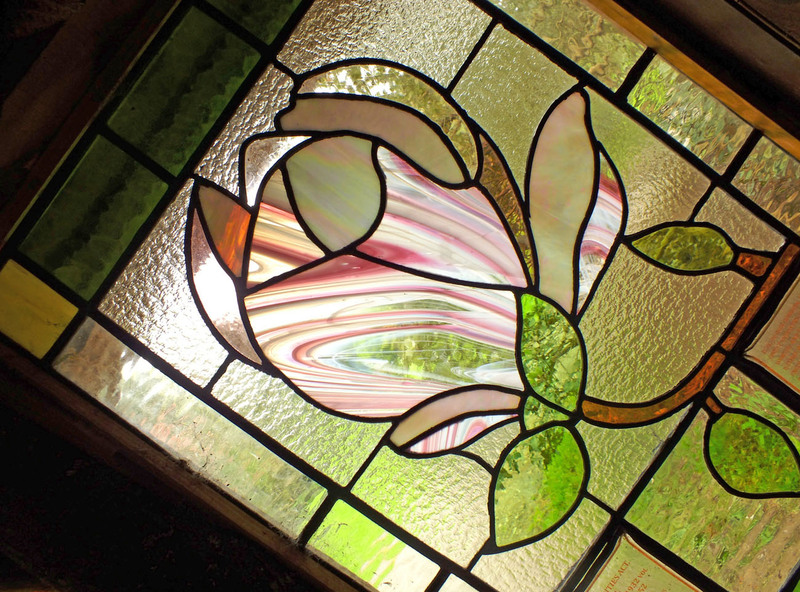 The magnolia, “Rustic Rubera” window is for Ida Copeland and highlights her time as an MP for Stoke from 1931 to 1935 and contains an excerpt from her maiden speech to Parliament on the introduction of import duties on inferior ceramics being imported from abroad, taking away work from highly skilled people and threatening their livelihood. 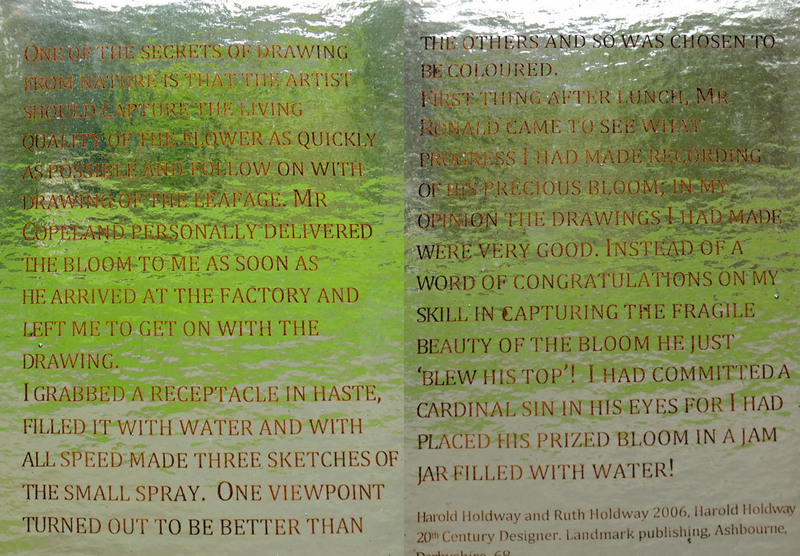 The rhododendron, “Taurus” window celebrates Ronald Copeland’s passion for rhododendrons and retells a story told by Harold Holdway, chief designer at the Copeland factory in Stoke. Mr Copeland took his prized rhododendrons from Trelissick and had Harold Holdway create designs from them for a Botanical series. *The Cornish prefix ‘Car’ or ‘Caer’ denotes a fortified place. 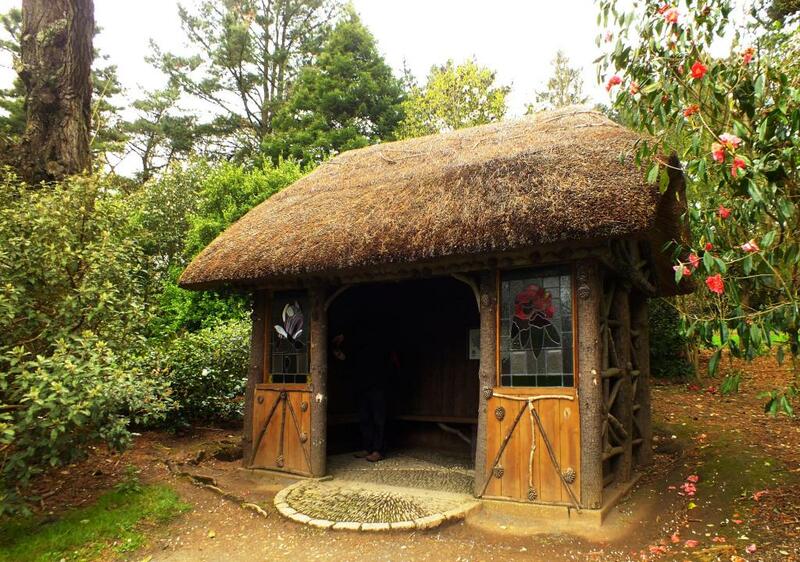 It contains mass plantings of daffodils followed by camellias, magnolias (including magnolia Trelissick), rhododendrons, viburnum and many other shrubs. Deutzia gives an early summer show, and lace-cap hydrangeas offer colour well into autumn. 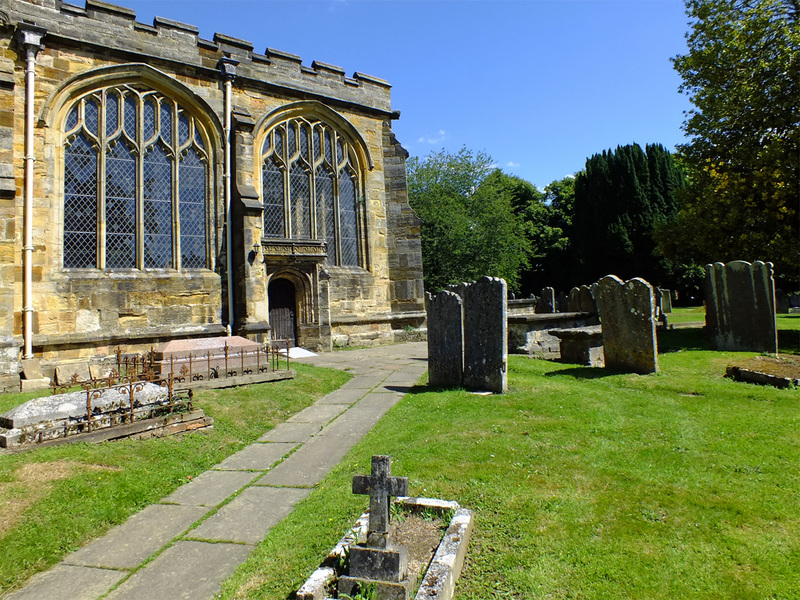 If you read about my recent visit to the delightful Weald town of Cranbrook you will have seen my reference to St Dunstan’s church which is known as the ‘Cathedral of the Weald’. Wealth from the cloth industry enabled successive enlargements of the medieval church in the 15th and 16th century. This delightful church is well worth a more detailed look around, so let’s go inside. Around the church are information panels providing details about particular interesting objects within. This font is Victorian from 1852, and example of early Victorian Gothic and made of Caen stone. 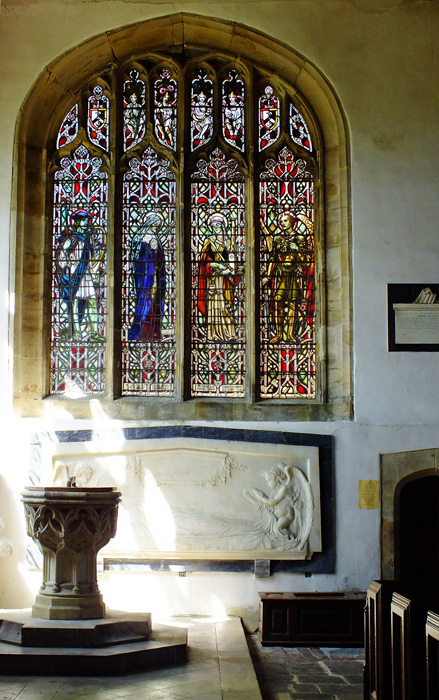 The white marble carved figure behind commemorates Thomas Webster, an artist, and the Alexander Window above was installed by Col Alexander in memory of his wife and three children. 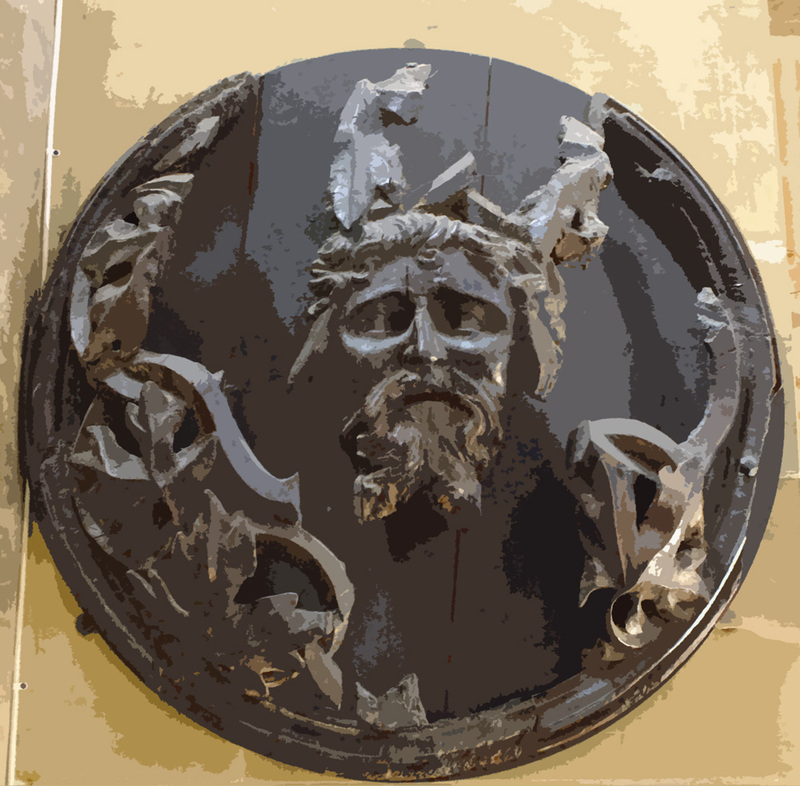 Although of pagan origin it is not unusual to find carvings of the Green Man inside a Christian church, even Canterbury Cathedral has 80 of them. When this church was built Cranbrook was surrounded by dense forest – the Weald. Four circular oak shields depicting these fierce-looking woodland spirits can be found here. This beautiful serene corner of the church is named after St Thoma a Beckett, who by the 15th century had replaced St Dunstan as England’s most popular saint. 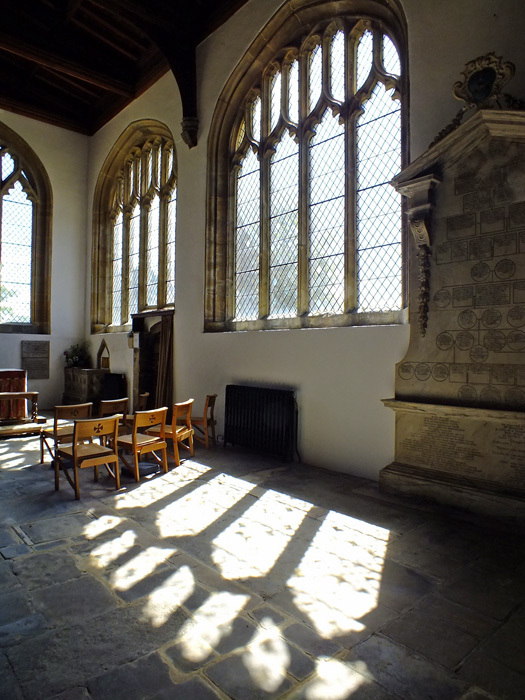 I loved the light flooding through the clear leaded windows. This porch was built around 1390. The wooden door added in 1569 at a cost of 17 shillings and 7 pence (£2k today). On the ceiling is a stone-carved Green Man. And a final look at the church surrounded by the old graveyard with interesting headstones. If your interest is windows then Dawn from ‘The Day After’ invites participants to post pictures of any windows that they find curious, inviting, photogenic, or in some way tell a story.